First section, an exegesis on synonyms and word games. With dedication and a vowelled poem. By Rav Shlomo Papenheim. Printed by Yehiel Michal Maya. 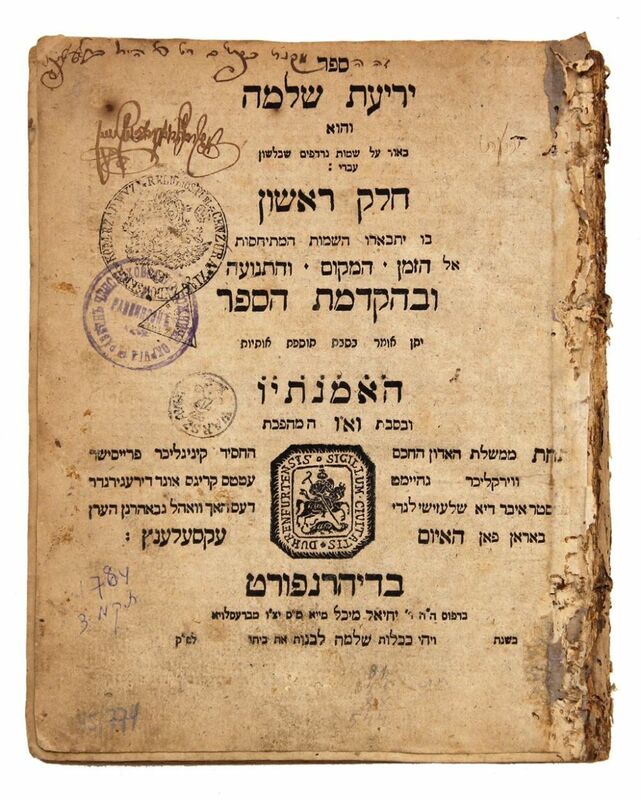 | Rav Shlomo Pepenheim (1740-1814) was a dayan in Breslau, a linguist and Hebrew poet. While he was an ardent supporter of the Haskala, he strongly opposed religious reforms and the proposal by David Friedlander that education pass to the government’s control. Ancient signatures, stamps of the censor. Missing the binding. Disconnected pages. Moth holes. 122 pages. 20cm. Ok condition.